During the week I watched an excellent four minute clip by a man called Kerwin Rae. He is a businessman, entrepreneur, investor, international speaker and a very dynamic man. In 2009, Kerwin suffered a stroke and was lucky to survive. After the stroke, his short term memory was reduced to 15 seconds which meant he stopped paying attention to what people were saying because he couldn’t retain the information anyway. Instead, he started to “feel” them to work out whether he wanted them to be near him or not. Through this process he honed his intuition and became very skilled at feeling energy and intention. In this clip Kerwin talks about the energy that people have and how, when we develop our own intuition, we are able to accurately feel the intention of the people around us. He says that intention is the energy that is being sent out by another that we then intuitively pick up on. Have you ever walked into a room and met a person and they have just felt wrong or bad? They may not have even spoken yet, but energetically, your intuition is picking up on them and their intention. Alternatively, have you ever met someone who you connected with instantly and felt a lot of energetic attraction to even if a single word had not yet been said? I am a huge believer in the philosophy of energy and intuition. We are energetic beings living in an energetic world, so it makes perfect sense that we can pick up on someone else’s energy/intention even if we are not aware that we are doing it. The points that really captured my attention in this short clip were Kerwin’s views on how we respond to our intuition – our innate knowing that often cannot be explained by logic or reason. He said that normally two things happen: Firstly, we simply don’t hear our intuition because of the amount of noise that is in our internal or external environment. We are so over-stimulated with noise, colour, technology and life that we struggle to hear the quiet whisper that is our intuition (and often it is just a whisper). Secondly, Kerwin said that when we do hear our intuition, we follow it and if things appear to go wrong we tend to blame it and vow that we will not listen to it again: “Damn! I am not listening to my gut again – that turned into a disaster!”. We give up on it so quickly when we don’t enjoy the outcome. The defining point that I love about this is that it is unfolding exactly as it should. He said our intuition is connected to infinite intelligence, and it is playing a far bigger game than what we can ever conceive. So we follow our intuition, something goes “wrong” and we stop following it, when we should instead trust that whatever happened is a part of the process to get us to where we need to be. We need to trust that we are getting the learning that will prepare us for the journey we are on – that in actual fact this event is the prerequisite for the amazing event that will unfold in two, three, or four years time. Kerwin’s main point of the clip is that when we hone our intuition we become so much better at business and life in general. 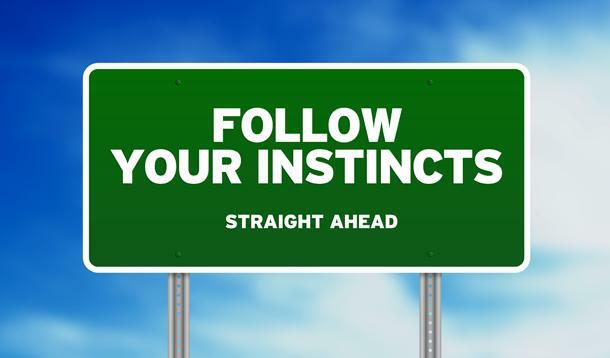 Intuition is not about everything feeling great, it’s about connecting to a game plan that is far greater than what our minds can appreciate and therefore living our most abundant life.